The congregation known today as Madison Avenue Presbyterian Church can trace its roots to the organization in 1834 of the Manhattan Island Presbyterian Church, located on Fourth Street near the Lower East Side shipyards and also called the Church in the Swamp. This struggling congregation expired a few years later, but in 1838 some of its erstwhile members united with a contingent from the old Seventh Presbyterian Church to form the Eleventh Presbyterian Church. It was formally organized by the Third Presbytery of New York on May 13, 1839, and consisted of 89 members. For three years the place of worship was edifice of the former Manhattan Island Church. A new church was erected on the corner of Avenue C and Fourth Street, and it was dedicated in October 1842. Old church records indicate some of the tribulations it survived. A controversy was reported in the Mexican War era over the introduction of organ music, which some opposed as a dangerous theatrical diversion. During the Civil War a member was reportedly tried by Session for reading Sunday newspapers and for objecting to legal penalties for not attending church services (that case was dismissed with admonition). In 1864, the now vigorous Eleventh Presbyterian Church moved northward to 55th Street between Lexington and Third Avenues, where it merged with the Memorial Presbyterian Church. At this time, there were two Presbyterian bodies: the Old School and the New School. In 1869, the two General Assemblies united to the great joy of all Presbyterians in the country. In commemoration of this notable event, the Rev. Dr. Charles S. Robinson, pastor of the Eleventh Church, led his congregation to erect a memorial temple in which to worship in the future. The church on 55th Street was sold, and a new edifice, to be known as "The Presbyterian Memorial Church," was built on the southwest corner of Madison Avenue and 53rd Street. Designed by D. & J. Jardine in a "round Gothic" style, the new church and lecture room occupied a site measuring 125 feet fronting Madison Avenue by 120 feet along the street. Built entirely of Belleville and Dorchester stone at a cost of $310,000, the church was notable for its tower and spire that rose 220 above the sidewalk. The interior of the church had galleries on three sides and it was decorated in dark rich tints with a profusion of gilding. All woodwork and the paneling about the pulpit was of solid black walnut, and the organ loft was immediately behind the pulpit. Lighting of the gas jets was accomplished simultaneously by a new and improved process. The carpeting was of light Brussels in a yellowish cast, and the cushions of the seats were in crimson. Opening services were held on December 22, 1872, and on Sunday, January 26, 1873, the church was dedicated. In 1883, the society was officially renamed "Madison Avenue Presbyterian Church," after two previous societies by that name had gone out of existence. One more move lay in store. In 1899, the congregation united with the Phillips Presbyterian Church, which had evolved from the downtown Fifteenth Street Presbyterian Church that had been organized in 1844. The Phillips Church, named in honor of the Rev. William Wirt Phillips, had been established in 1858 under the leadership of James Lenox, a distinguished Presbyterian who had donated the land in the area now known as Lenox Hill. At the time of the merger, the Phillips Church was worshiping in a Victorian Gothic building designed by R. H. Robertson and erected in 1873 on the northeast corner of Madison Avenue and 73rd Street. The combined congregation was to take the name of Madison Avenue Presbyterian Church, and plans were made for a new sanctuary on the site of the old, retaining a portion of the Phillips building for meeting rooms, offices, and choir rehearsals. This annex, known at the Phillips Chapel, is extant on 73rd Street. The present Madison Avenue Presbyterian Church was designed in 1899 by James E. Ware & Son and opened the following year. Ware & Son's plans called for a flat limestone exterior, a steeply pitched roof, and a corner tower that was crowned with rounded pinnacles and a cone-shaped steeple. Inside, the spacious sanctuary had a raked main floor with galleries on three sides. Natural illuminatation was provided by three divided windows and dormers on the south, and a large window over the west gallery. In 1916, the multi-storied church house was built on Madison Avenue, providing space for the large Sunday School, numerous meeting rooms and administrative offices, a gymnasium, swimming pool and bowling alley. Both the church house and sanctuary were refurbished in 1961 at a cost of $1 million. At that time, the Madison Avenue facade was altered when a single carved portal replaced three arched doorways that had been adorned with finials. The chancel was enlarged and provided with movable choir pews and pulpit so that the area could be used as a stage, and a large gilded cross was hung in front of a new wood-and-fiberglass reredos that concealed pipes of the new Casavant organ. In 1999-2000, the sanctuary was renovated again when a new marble floor was installed in a reconfigured chancel, the main floor was leveled, the narthex was enlarged, new lighting installed, and architectural and decorative features were uncovered and restored. The organ in Madison Avenue Presbyterian Church was originally built in 1961 by Casavant Frères of St. Hyacinthe, Québec. In 1968, the Swell chorus reeds (16' Petite Bombarde, 8' Trompette and 4' Clairon) were replaced by M.P. Möller. In conjunction with a major renovation of the sanctuary in 2000, the Schantz Organ Company of Orrville, Ohio was contracted to install three additional pipe ranks in front of the oak screen, several digital stops, a solid-state combination action, and a new three-manual drawknob console. The console is movable but is normally positioned in a lift-equipped pit behind the communion table. From 2010-11 the organ was thoroughly reconditioned by Casavant Frères, its original builder. All of the removable mechanisms and nearly 1,000 pipes were returned to the Casavant workshop for restoration, and all reed pipes were repaired, retongued and revoiced. The remaining 3,000 pipes were cleaned, repaired and revoiced onsite. At this time Casavant added two new stops: an 8' Clarinette rank in the Choir division, replacing the original 4' Chalumeau à Cheminée; and Clochettes (Cymbelstern). The organ was rededicated in two concerts, beginning on February 5, 2012, with a solo recital by Dr. Andrew E. Henderson, Director of Music & Organist, followed on February 26 by a Casavant Organ 50th Birthday Concert featuring the Saint Andrew Chorale & Orchestra, with Andrew Henderson, Mary Huff & John Weaver, organists & conductors. In 1961, an entirely new organ was built by Casavant Frères of Canada, as designed by Lawrence Phelps of Casavant in conjunction with Dr. George B. Markey, organist and choir director, and Dr. Robert Baker, consultant. 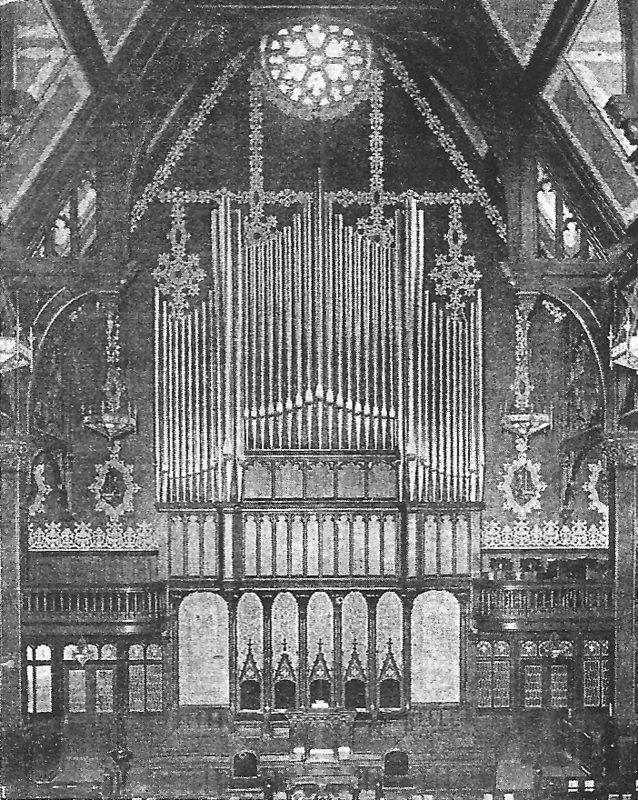 Pipes of the new organ were installed behind a large oak screen across the front of the sanctuary, and the console was placed to the right of the chancel. Built at a cost of $86, 240, the organ was dedicated in a service on March 4, 1962 that featured Dr. Markey as organist, with an orchestra comprised of students from The Juilliard School, and the church choir. Dr. Seth Bingham, Organist Emeritus, conducted the premiere of his composition, "Sing to the Lord a New Song," for organ and choir. In 1923, Casavant Frères of St. Hyacinthe, Québec, was contracted to rebuild and enlarge the 1900 Hook & Hastings organ, to the specifications of Seth Bingham (1882-1972), who was organist and choirmaster from 1913 until his retirement in 1951. Casavant installed the organ behind the existing Hook & Hastings facade and two new screens at either side. The detached, four-manual drawknob console was located behind the choir stalls on the right side of the chancel. "The beautiful exterior is designed by the Church Architect, and comprises righly wrought and moulded oak casing, supporting various groups of large display pipes finished in gold leaf, the whole forming a most attractive feature as seen fillin the gallery above and behind the pulpit; the organist with a detached console being placed with the singers at one side of the organ." Performing in the programme were Miss Henriette D. Judd, Organist and Choir Leader, assisted by Miss Florence de Vere Boese, Soprano, and Mrs. M. T. Corcoran, Contralto. Soprano Solo,—"O had I Jubal's Lyre,"
Miss Florence De Vere Boese. Mezzo Combination, Great Reversible Pedal, from Sw. to Gr. The Schantz organ in Dana Chapel was originally built in 1961 for the Lower Church of the Church of Our Lady of Good Counsel in Newark, N.J. In 1978, the organ was purchased by Madison Avenue Presbyterian, and was installed in September 1978 by Ronald C. Bishop, the area Schantz representative. This instrument replaced an Allen electronic organ from the 1960s, which replaced a Hammond electronic dating from the renovation of the chapel in 1949. The organ in the new Presbyterian Memorial Church was built in 1872 by J.H. & C.S. Odell of New York City. Odell provided 26 stops that controlled 29 ranks, and there was a 34-note set of chimes. The case was of pine, painted and grained, and the facade pipes were decorated in various colors. The handwritten contract stated that the organ would be ready on or before October 1, 1872. The American Musical Directory of 1861 shows that the organ in this church had "1 bank keys, 8 stops, 1 octave pedals" and was "Built by Jardine & Son, in 1857." Specifications for this organ have not yet been located. The American Organist (Aug. 1962). Specification of Casavant Frères organ, Op. 2660 (1961). "The Busy Builders," The New York Times (Sep. 3, 1872). Deems, Charles Force. Frank Leslie's Sunday Magazine (July-Dec. 1882). New York: Frank Leslie's Publishing House, 1882. Farnam, Lynnwood. "Organ Notebook" with specification of Hook & Hastings Organ, Op. 1880 (1900). John de Lancie Library, The Curtis Institute of Music, Philadelphia; Sally Branca, Archivist. Courtesy Jonathan Bowen. Henderson, Andrew E. Provenance of Schantz organ, Op. 506 (1961) in Dana Chapel. "Memorial Church. Opening Services at the New Presbyterian Memorial Church, in Madison-Avenue–A Magnificent Structure," The New York Times (Dec. 23, 1872). Organ Dedication program (Mar. 4, 1962) with final specification of Casavant Frères organ, Op. 2660 (1961). Pub. by the church. Courtesy Andrew C. Henderson. Organ Dedication program (Nov. 25, 1900) with specification of Hook & Hastings organ, Op. 1880 (1900). Courtesy Larry Trupiano. "Renewed Edifice Opens to Worship," The New York Times (Nov. 13, 1961). Scheer, Stanley. Factory Specification of Casavant Frères organ, Op. 1000 (May 8, 1923). Scheer, Stanley. Factory Specification of Casavant Frères organ, Op. 2660 (Jan. 23, 1961). Trupiano, Larry. Factory contract for J.H. & C.S. Odell organ, Op. 116 (1872). Bowen, Jonathan. Console of Casavant Frères organ, Op. 1000 (1923). Deems, Charles Force. Memorial Presbyterian Church. Frank Leslie's Sunday Magazine (July-Dec. 1882). Madison Avenue Presbyterian Church Archives. Photos of sanctuary interior (c.1939); Casavant Frères organ, Op. 1000 (1923); and Hook & Hastings organ, Op. 1880 (1900). Courtesy Andrew E. Henderson. Lawson, Steven E. Church interior; Schantz Organ Company console (2000); Dana Chapel. Organ Dedication program (Nov. 25, 1900). Facade of Hook & Hastings organ, Op. 1880 (1900). Courtesy Larry Trupiano. Scofield, Jeff. Original console of Casavant Frères organ, Op. 2660 (1961).